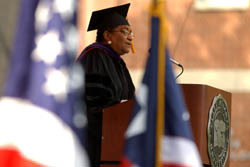 Liberian President Ellen Johnson Sirleaf receives an honorary doctor of laws degree. ATLANTA (UMNS) — When Liberian President Ellen Johnson Sirleaf spoke at the fall convocation of Clark Atlanta University, she lauded the school’s "rich Christian tradition" and noted that its religious affiliation is the same as hers: United Methodist. Sirleaf was at the ceremony Sept. 12 to receive an honorary doctor of laws degree given in recognition of her accomplishments and leadership as the first woman president of an African country. Clark Atlanta is one of 13 historically black colleges and universities related to the United Methodist Church in the United States. Dorcas D. Bowles, provost and vice president of academic affairs, presented Sirleaf with the degree, calling her "a beacon of hope for Liberia." Bowles also noted that the president had graduated from a United Methodist high school in Liberia. She is an active member of Monrovia (Liberia) First United Methodist Church. Sirleaf spoke to the audience of students, faculty, guests and a local contingent of Liberians who cheered her speech while waving Liberian flags. She offered not only a history lesson on the "devastated past" of her country, but also set forth plans for a national renewal. "It is our delayed destiny to rise from the ashes to a successful, united and prosperous nation," she said. She emphasized that education will be the key to improving the quality of life for Liberia’s people. Located on Africa’s west coast, Liberia suffered through almost 15 years of civil war, which brought death, destruction and the displacement of many Liberians to other countries. 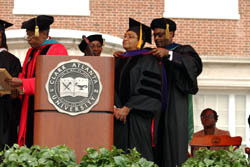 Ellen Johnson Sirleaf speaks at the fall convocation of Clark Atlanta University. Sirleaf called education "the most potent guard against ignorance, disease and poverty," and offered ideas for joint educational efforts between Liberians and institutions such as Clark Atlanta. She suggested scholarships for Liberian students and programs encouraging U.S. university faculty to work in Liberia. Liberia is "rich in natural resources — including gold, diamonds, iron ore, forests, fertile soil, edible fish and 400 miles of coastline," she said. "Our human resources are our most valuable asset ? and with proper education, we will be empowered to join in a national renewal." Liberia is at "a historical fork in the road" as it embarks on an "ambitious task: nation building," she said. She predicted a "national identity, a shared national vision, a secure and stable environment, a reconciled people with freedom of choice, a democracy with equal opportunity and opportunity for development." Education will be the key to a successful transition from war to peace, she said. "We will have and must maintain a universal primary education system," she said. Diversified and technical instruction will be tools to improve the quality of life, much "as food, water and oxygen feed the body," she said. Such education will be "indispensable for national success and will promote gender equity through equal access to education." It will also empower Liberians to compete in the marketplace, she said, and she invited U.S. businesses to seize the opportunities that exist in her country. Often referred to as "the Iron Lady," she has a four-decade career in both the private sector as well as international statesmanship, and holds a master’s degree in public administration from Harvard University. Elected president of Liberia last November, she was inaugurated in January and became the first elected black female head of state in the world. Forbes magazine ranked her 51st on its list of the 100 most powerful women in the world this year. Sirleaf has lived in both Liberia and the United States, holding posts in business as an economist for financial institutions such as the World Bank and Citibank, and in international public policy, serving at one time as an assistant secretary-general for the United Nations and as assistant administrator and director of the U.N. Development Program Regional Bureau for Africa. In closing, the president encouraged her audience to "join hands with Africa’s oldest democracy, to walk away from disappointments ? toward a future of hope and promise." Said Sirleaf: "If we mobilize our resources, both natural and human, Liberia indeed will rise again." *Dukes is staff writer for the Wesleyan Christian Advocate, the newspaper of the United Methodist Church’s North and South Georgia annual conferences.